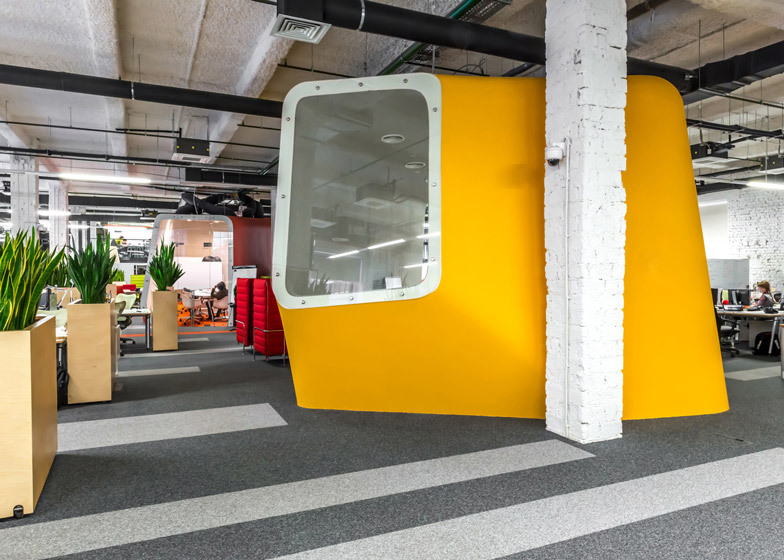 Brightly coloured pods resembling submarines contain meeting rooms at the new Moscow office for internet company Yandex by Russian studio Za Bor Architects (+ slideshow). 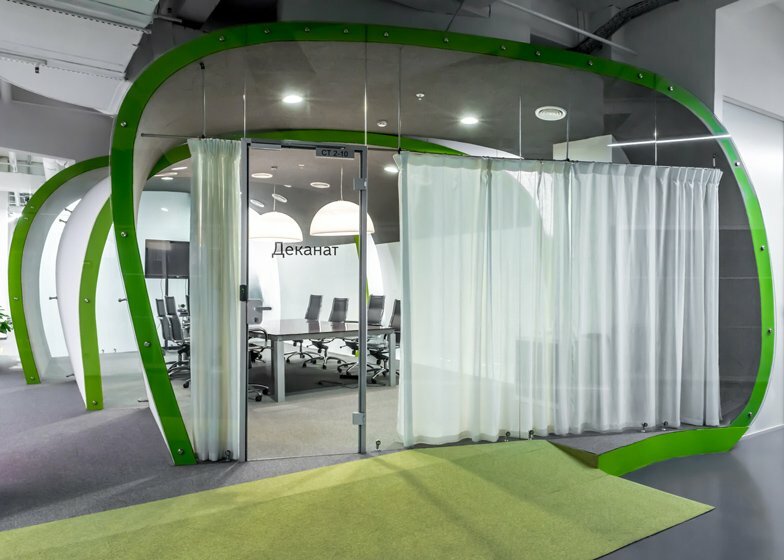 Za Bor Architects has previously designed several offices for Russian firm Yandex, including one in St Petersburg featuring giant three-dimensional computer icons, and this time renovated five floors of a building in Moscow's Krasnaya Roza 1875 business district. 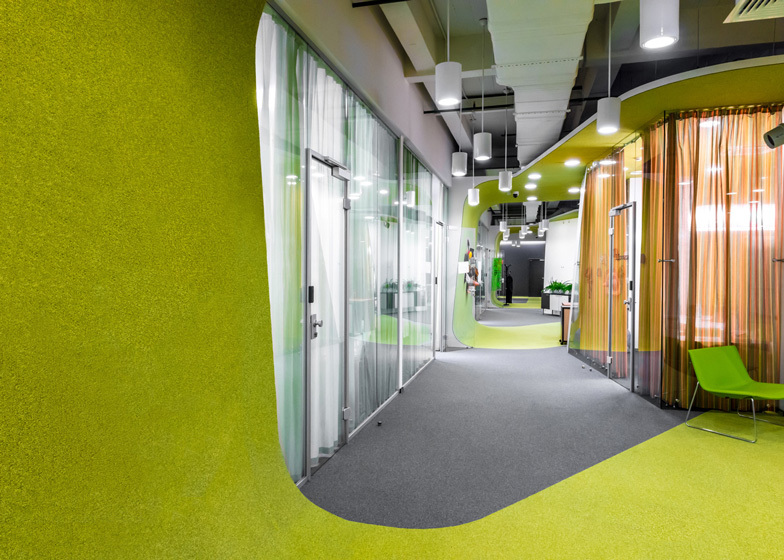 The architects developed a scheme incorporating colourful communal areas and meeting rooms interspersed among more typical workspaces, which feature a muted palette of grey and white. "The client, as usual, wanted to see a happy and comfortable interior that would hold a large number of specialists," said the architects. The red and yellow meeting cabins are located on the fourth floor, and incorporate transparent panels resembling giant portholes fixed to the exterior of their rounded walls. 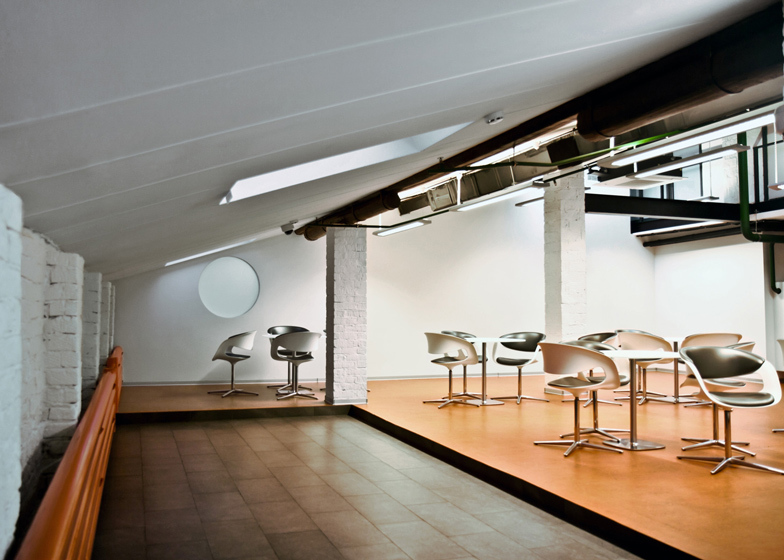 Groups of sofas with high padded backs and sides are arranged close to the pod-like meeting rooms to create additional places for secluded working or conversations. 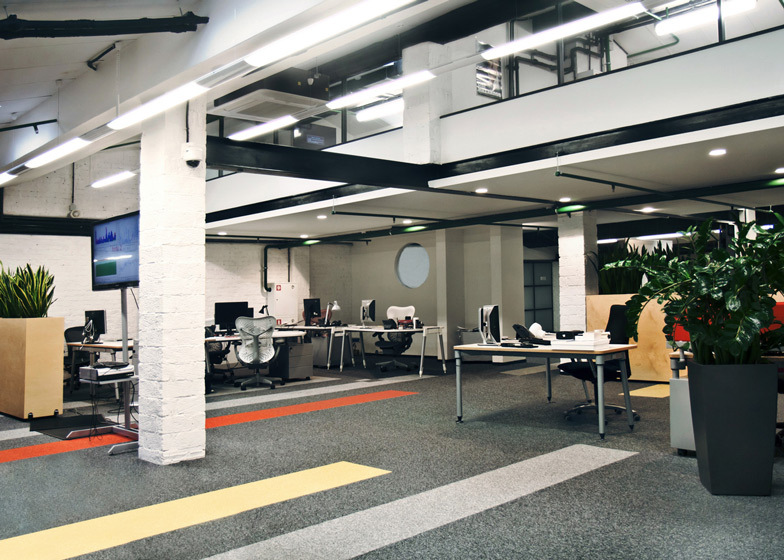 Original features such as brick walls and columns were integrated into the design, contrasting with new additions such as the colourful pods and furniture. 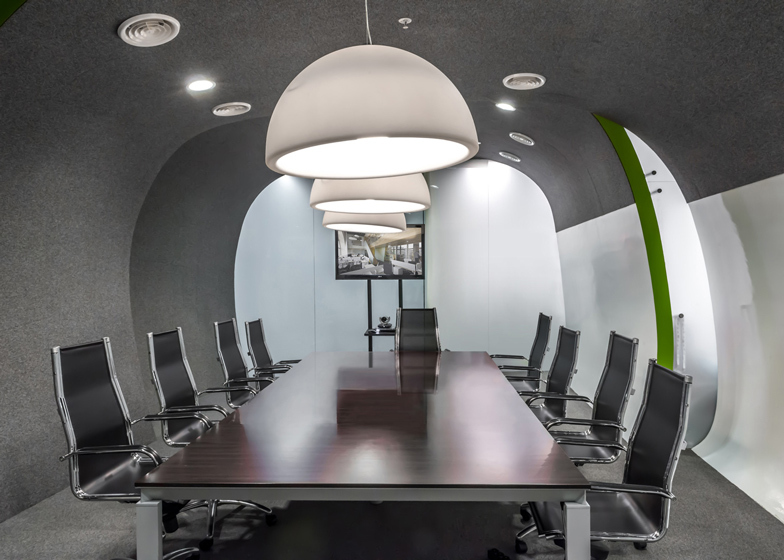 Two meeting rooms on the second floor are constructed as cave-like spaces with curving ceilings and walls covered in grey carpet. The rounded shells of these rooms are staggered to make room for glazed gaps that allow light to enter, while curtains along the glazed front walls can be drawn when privacy is required. 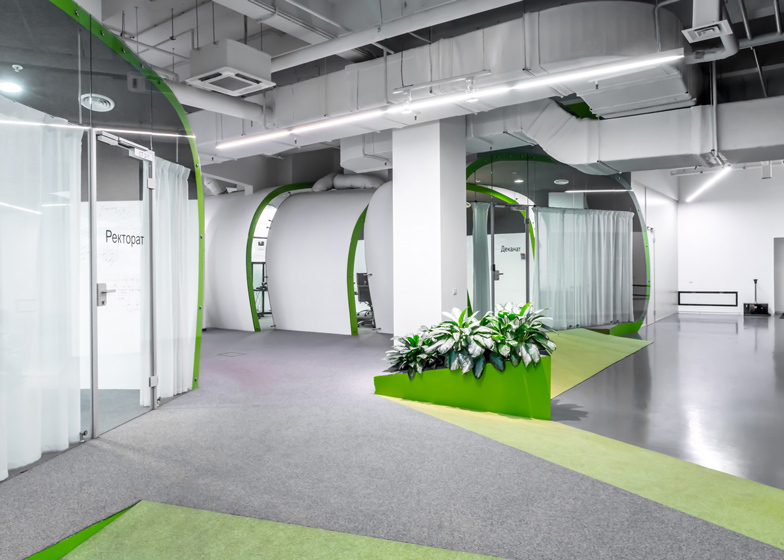 On the lower levels, a stripe of green carpet meanders across the floor, and loops up onto the walls and ceilings that envelope glass-walled meeting rooms. "The first three floors are connected with a generic element which is intended to form a giant ribbon that, while penetrating floors, forms streamlined volumes of meeting and conference rooms," said the architects. 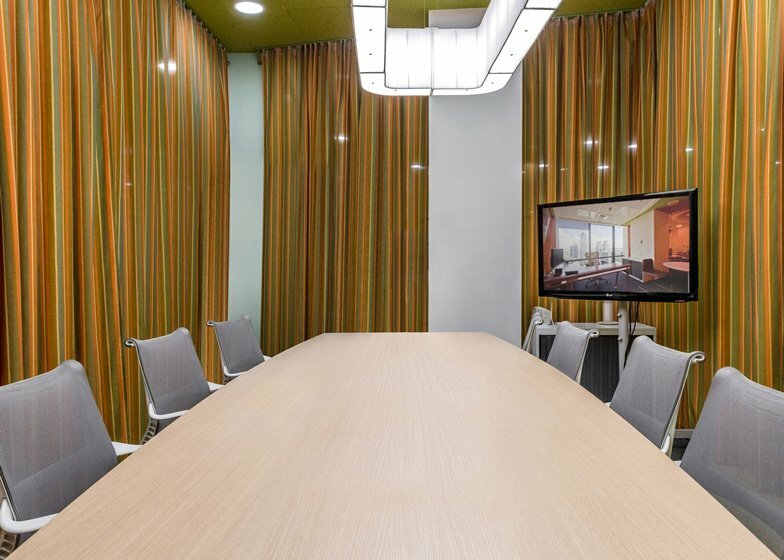 Curtains enclosing the meeting rooms on these floors match the orange and green colour scheme of the surrounding walls and furniture. Photography is by Maria Turynkina and Dmitry Kulinevich. 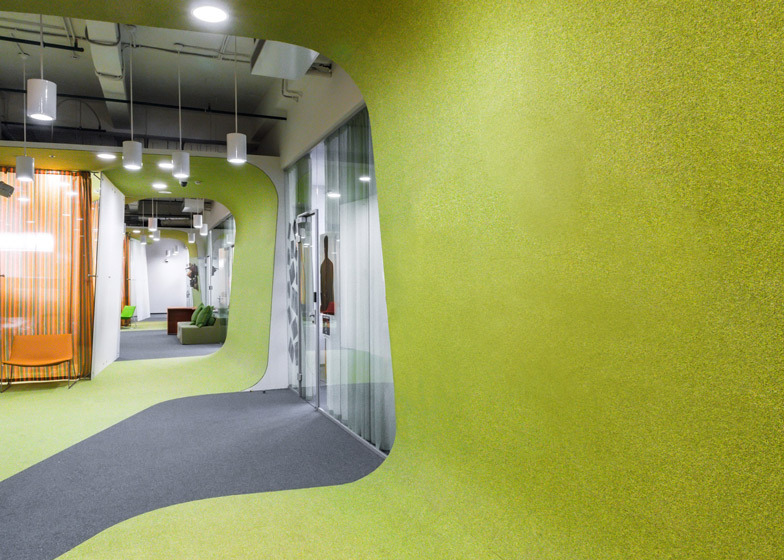 The main place in Za Bor Architects' portfolio is held by offices of IT-companies. 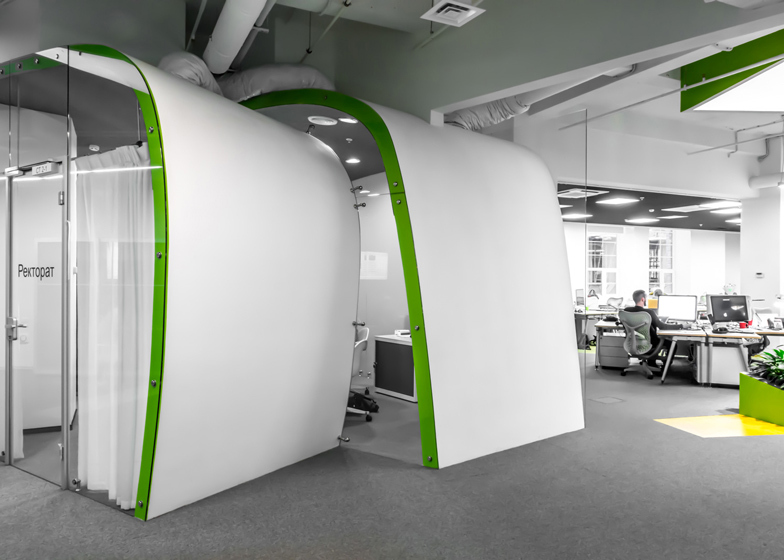 It has a lot to do with a pretty informal and creative atmosphere that these firms are willing to build up for their employers, because working environment is one of the key factors that affect the company’s attraction. 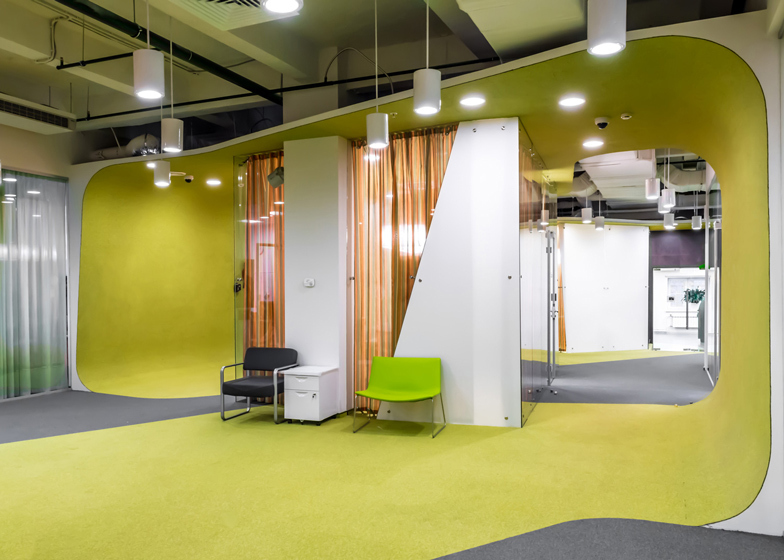 It is worth to note that Yandex – the largest IT-company in Russia, and one of the world’s leaders in this field, has been entrusting their offices to Za Bor Architects for six years already. 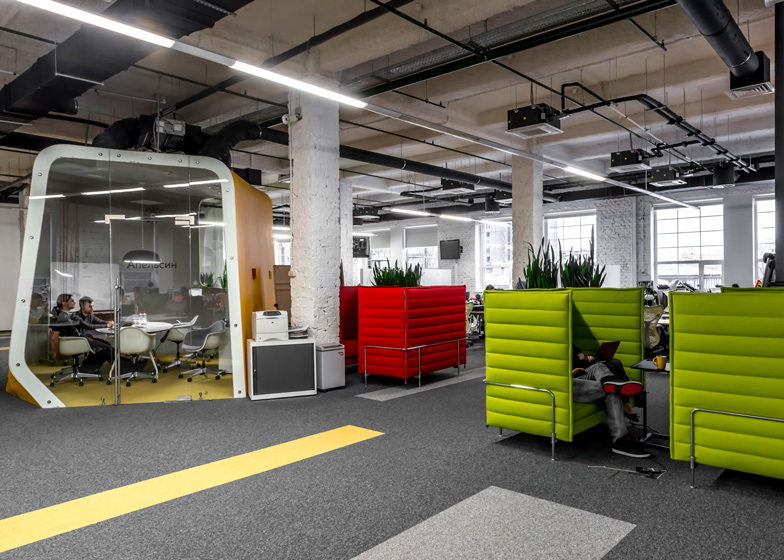 Today there are 21 Yandex office in 12 cities of four countries of the world, that Za Bor Architects have developed. 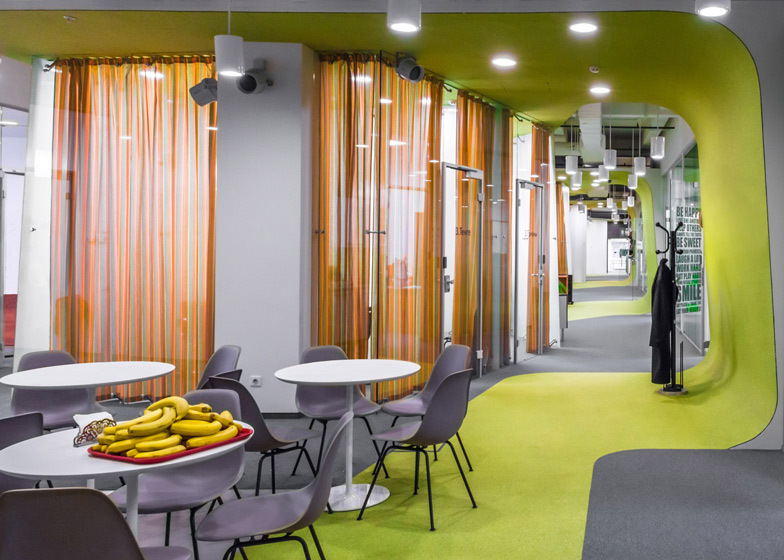 Recently one more Moscow office of Yandex was opened in Stroganov building in Krasnaya Roza 1875 business quarter. This reconstructed building is full of columns and inter-storey premises, which influenced the interiors a lot. The client, as usually, wanted to see a happy and comfortable interior that would hold a large number of specialists. The first three floors are connected with a generic element, that is intended to form a giant ribbon, that, while penetrating floors, forms streamlined volumes of meeting and conference rooms. The first three floors have the following common elements of all Yandex offices, as open communication lines on the ceiling, unique ceiling lights in complex geometrical boxes, and compound flowerpots with flowers dragging on to the ceiling. Alcove sofas by Vitra are used as bright colour spots, and places for informal communication. Wall finishing is traditionally industrial carpet, marker covering, cork; and of course, a poured floor. The fourth and fifth floors are constructed in a totally different style. 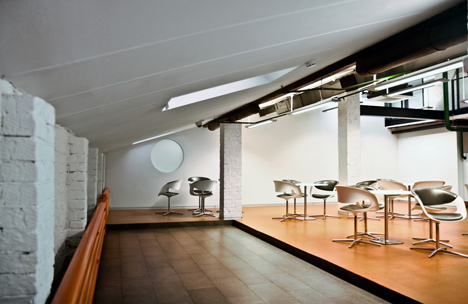 You may only notice two signature elements of Za Bor Architects here – large meeting rooms – architects call them bathyscaphes, and employees named them Orange and Tomato due to their colours. Such difference in decoration is determined with very complex construction elements and level differences in the building (the ceiling height varies from 2 to 6 meters), balconies, beams that were left from the previous tenants. Nevertheless, here we can see new colours, partition walls and flooring. Here, in these neutral grey-white interiors, rather than elsewhere, there are many workplaces completed with Herman Miller systems, and the largest open-spaces. Also there are cafeteria and game room with a sport corner. 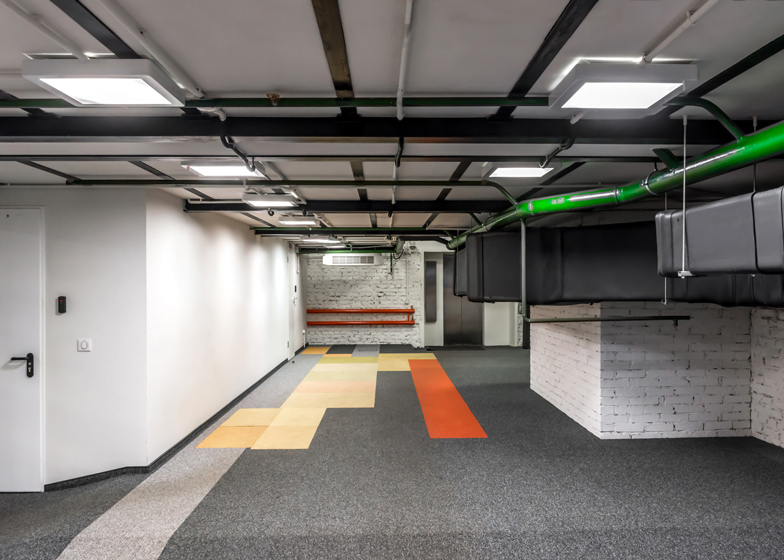 This has constrained partition of the building into two separate office, in fact it helps clients and numerous visitors of Yandex Money department to deal with their issues, without distracting technical specialists, located on the top floors.